Well, the old saying "There's no such thing as bad publicity" may often seem to apply to the Loch Ness Monster. 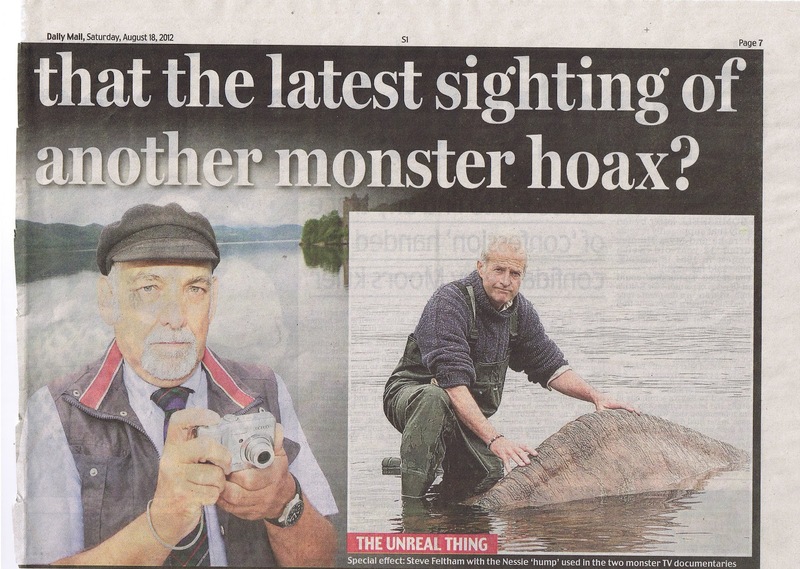 The story of George Edwards and his Nessie photo continues to go viral and has finally reached the exalted shores of the mainstream American Media as this item from ABC News shows. Attempting to dig deeper into this latest story is proving somewhat fruitless. The one lead is that two separate sources talk about multiple pictures but don't show them. I am sceptical about that just now but I sent off an email to Cascade News who are syndicating George's photograph. Their own website only shows one picture of the object so I suspect that is all there is to it but I await their response. I have sent off another email to George Edwards but still no reply to the questions I originally put to him. Going by his interview on ABC, it sounds like the world has arrived at his doorstep and I suspect I am way down the pecking order! I must also add that after posting this blog, I strolled into my local newsagent and saw the front page of the Scottish Sunday Mail proclaiming they had evidence that George Edwards had faked the whole incident (see extract below and click to enlarge). I haven't seen this article on their website but if it doesn't turn up, I will post more details. But suffice to say the accusation is that Edwards used an old Nessie prop from some documentaries to stage the picture. George Edwards denies everything but judge for yourself. The fibreglass hump does look indeed like the object in the picture though I must also admit the two are not exactly the same shape. The object in the picture slopes more to the front than the model. Moving onto another item, I understand that Jeremy Wade of "River Monsters" fame is filming a new series and he is going to Loch Ness for one episode. My only reply is "about time too"! I wonder what stance he will take as he tries to land Nessie with a fishing rod the thickness of a fence post? Perhaps the Sturgeon or indeed the Wells Catfish or the oft talked about Giant Eel? Certainly, when he tackled the reputed monster of Lake Iliamna, the sturgeon came to the fore. Well, I guess we will find out when the series goes to air - presumably next year. Talking of next year, 2013 will be the 80th anniversary of the Loch Ness Monster. It was back in May 1933 that the first modern sighting of the creature by the Mackays was written up for the Inverness Courier by the late Alex Campbell. It is amazing that the beast still continues to hold the attention of people after so many years and even in such a current sceptical environment. 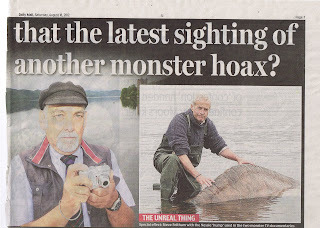 Does this speak as much to the "I want to believe" as to the actual existence of something large and unknown in the loch? The answer is "yes" to both. Wouldn't it be great to mark this milestone with some kind of event? Again, the answer is "yes" and it is my hope that some kind of event will be organised that covers the spectrum of thinking on the subject and does justice to a now venerable tale. Well, all I can say is watch this space! The Loch Ness Monster Swim gets underway on the 18th August with hundreds expected to take part in order to raise money for the Marie Curie Cancer Care. A worthy cause but you would have thought that the Jaws-like promotional picture below would have deterred some from taking part! I was sitting by the loch a couple of years ago and there were three birds floating along on top of the water. I watched them dive down for food and for the life of me never saw them come back up. What could have eaten them, is there pike in the loch? I've heard that pike will eat ducks. Who can say, perhaps one bird could be taken by a reasonably large fish, but three? Anyway, since the Loch Ness Monster is mainly a bottom dweller, I am sure the swim will be a great success. Anyone with an interest in the Loch Ness Monster will tell you that the earliest account of the monster was by Saint Columba sometime in the 6th century AD. The story itself has been repeated countless times in books, magazine and newspaper articles since the early days of Nessie fever in 1933. Even the latest Nessie story can't help but stretch back nearly 14 centuries to make a mention of it. "is the oldest surviving copy of Adomnán of Iona's Life of Columba, and undoubtedly its single most important witness. It was copied at Iona during (or shortly after) Adomnán's lifetime, and is also a splendid example of early medieval insular bookmaking, having been colorfully described by E. A. Lowe as embodying the 'pure milk of Irish calligraphy'"
In times past, only the privileged and academic few would have been able to gaze upon this most rare of Loch Ness Monster documents but thanks to scanning technology and the Internet, it is now available to view to all. The document is hosted by the Virtual Carolignian Libraries of St. Gall and Reichenau (the former monasteries which held such documents). The actual physical manuscript is held by the Stadtbibliothek in Schaffhausen, Switzerland. Now going to the above link presents a Latin document in a beautiful but difficult calligraphy which makes the task of finding the story a challenge. However, after some digging about, I have found the two relevant pages that relate the tale of St. Columba and the monster and they are reproduced below. They are located on pages 74 and 75 and the story begins with the red text at the bottom right of the first page with a reference to the "aquatilis bestiae" or water beast. If you then go over to the right hand column and look down to the fourth line you will see the words "fluvii" and "nesa" which refer to the River Ness. The account ends on the right hand column of the next page prior to the next red words. I won't reproduce the entire Latin text but the english translation is below. OF THE DRIVING AWAY OF A CERTAIN WATER MONSTER BY THE VIRTUE OF THE PRAYER OF THE BLESSED MAN. At another time again, when the blessed man was staying for some days in the province of the Picts, he found it necessary to cross the river Ness ; and, when he came to the bank thereof, he sees some of the inhabitants burying a poor unfortunate little fellow, whom, as those who were burying him themselves reported, some water monster had a little before snatched at as he was swimming, and bitten with a most savage bite, and whose hapless corpse some men who came in a boat to give assistance, though too late, caught hold of by putting out hooks. The blessed man however, on hearing this, directs that some one of his companions shall swim out and bring to him the coble that is on the other bank, sailing it across. On hearing this direction of the holy and famous man, Lugne Mocumin, obeying without delay, throws all his clothes except his under-garment, and casts himself into the water. Now the monster, which before was not so much satiated as made eager for prey, was lying hid in the bottom of the river ; but perceiving that the water above was disturbed by him who was crossing, suddenly emerged, and, swimming to the man as he was crossing in the middle of the stream, rushed up with a great roar and open mouth. Then the beast, on hearing this voice of the Saint, was terrified and 'fled backward more rapidly than he came, as if dragged by cords, although before it had come so near to Lugne as he swam, that there was not more than the length of one punt-pole between the man and the beast. Then the brethren, seeing that the beast had gone away, and that their comrade Lugne was returned to them safe and sound in the boat, glorified God in the blessed man, greatly marvelling. Moreover also the barbarous heathens who were there present, constrained by the greatness of that miracle, which they themselves had seen, magnified the God of the Christians. Needless to say critics attempt to dilute the account on the grounds that it occured in the River Ness and not Loch Ness and that saints were encountering fabulous beasts left, right and centre. I address these objections in my book and mention two other stories of Columba and the Monster which are not so well known and place the beast firmly in Loch Ness itself. I would also note that a few modern sightings of the creature have occured in the River Ness. But I don't think anyone is suggesting these should be discounted because they did not happen in Loch Ness! In summary, it is a bit awe inspiring to see such an ancient document from the Dark Ages make mention of our favourite cryptid. One wonders how the monks who painstakingly created this manuscript would react if told the very creature they wrote of would still excite the imagination 1,300 years later?